Gone are the days of “spray and pray” in online advertising, holding thumbs that your scattered online banners are finding the eyeballs of the right audience. As strategic specialists, SPARK Media are excited to launch a ground-breaking new technology in online display advertising: Dynamic Ads – data-driven, innovative banners which allow for targeted ad customisation, adapting the ad for the viewer according to their location and weather conditions, thereby increasing its relevance. According to the British Retail Consortium, weather has the biggest influence on consumer behaviour, after the economy. It affects consumers’ emotional state, drives their purchase decisions based on the context they find themselves in, and even dictates how much they are willing to spend. There are huge opportunities for brands to tap into this insight using Dynamic Ads, targeting consumers with relevant messaging based on weather conditions, amongst other dynamic variables. The online banner advert’s images, offers and product details can be perfectly delivered to audiences based on clients’ selected variables, including: time, location, temperature, weather conditions, days of the week and language. Multiple dynamic structures can be chosen, for example combing a specific temperature range and day of the week. These external data points ensure that the best ad is delivered at the right moment to your viewer. The contextual relevance effectively appeals to a need that is top of mind for the consumer. “We’re excited to have Builders on-board as our first partner in piloting our Dynamic Ads. Using the weather condition variable, we’ve been able to target consumers with messaging around their JoJo tank product offering which is adapted based on whether it’s raining or not. We are currently testing these, and other creatives, in market to determine the various ways that marketers can best use these ads to drive conversion. We have been excited with the results so far,” says Marc du Plessis, Joint CEO of SPARK Media. For example, a rainy day would be the perfect opportunity for an online retailer to encourage consumers to shop online instead of braving the rain to the mall, or for a take-away app or restaurant to encourage eating in, or a clothing retailer to display a special on umbrellas and raincoats. Restaurants could use one of the other variables, the timing or day part variable, to target customers with breakfast, lunch, dinner or weekday specials. The opportunities are endless across all industries. “Dynamic Ads form part of SPARK’s programmatic advertising offering, SPARK Ignition, which allows advertisers to target relevant audience segments across the Caxton Network as an alternative to buying site specific impressions. Dynamic Ads allow us to take a company’s targeting to the next level, delivering their ad at the right moment to their specified target market, by featuring different banner communications based on dynamic environmental influences. 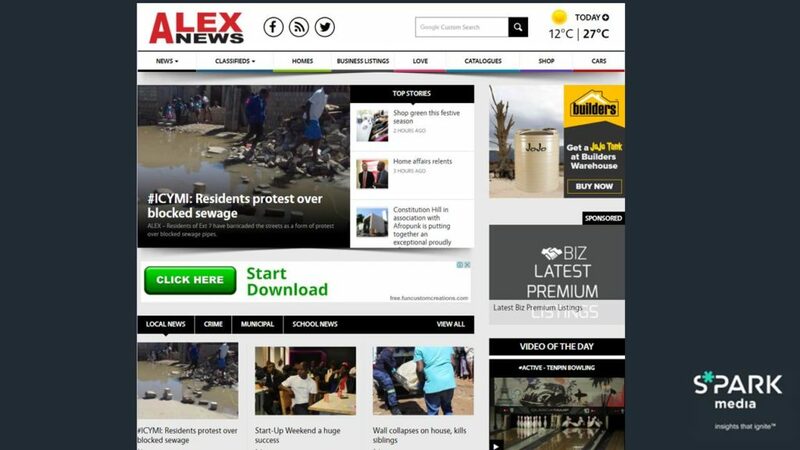 It’s a highly sophisticated technology that’s allowed us to add a level of intelligence to banner advertising, making it more relevant and thus, impactful,” adds du Plessis. Dynamic Ads give you the opportunity to dynamically target your key audiences with incredible creative combined with impactful messaging to create perfect campaigns with the right voice. To reach your target market in a unique and innovative way, contact SPARK Media: call +27 10 492 8391 or email info@sparkmedia.co.za.